Last week wasn't a great week for us; let's get that out of the way right at the start. Collectively, we went 0-5 in picking Eagles vs. Bucs, with all of us picking the hometown favorite to handle its business in Tampa. Of course, they didn't do that — nor were we alone in thinking that they would — and now the Birds return home looking to get back in the win column after falling to 1-1 last week. As Malcolm Jenkins pointed out to Joe Santoliquito in his weekly Safety Blitz column right here on PhillyVoice, that sounds an awful lot like how the Eagles' 2017 Super Bowl season started. A Week 1 win that required a big fourth-quarter stop by the defense (last season it was the Redskins), followed by a road loss to one of the hottest teams in the NFL (the Chiefs in 2017) that ultimately looked a lot closer than it was. Of course, the Eagles returned home last season to beat the Giants on Jake Elliott's 61-yard field goal as time expired, the longest game-winning field goal in franchise history. From there, well, you know what happened next. 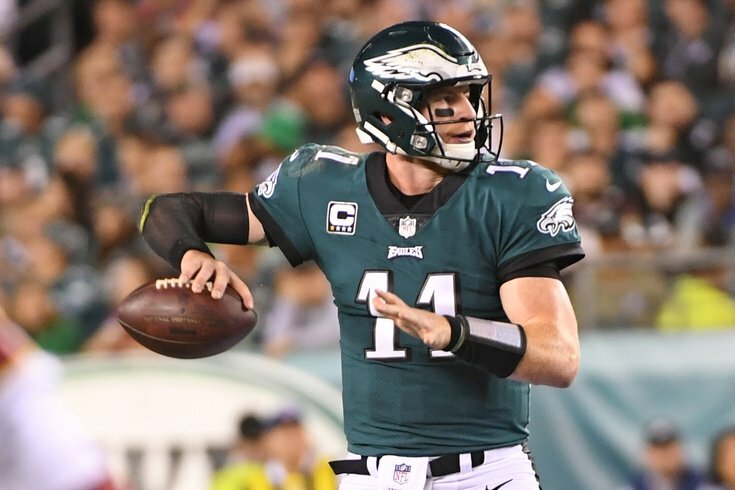 The biggest difference this time around, obviously, is the status of Carson Wentz, who missed the first two games of the season recovering from a torn ACL and LCL but was cleared to return earlier this week and will start on Sunday. I felt that Carson Wentz's 2017 training camp was, at the time, the best camp I had ever seen a quarterback have in my time covering the team, by far (though that wasn't a high bar). I thought he was even better in 2018, even at something less than 100%, albeit in limited action. He had more velocity on his throws, threw with better accuracy, and could still move around better than most starting quarterbacks in the NFL. I think he's going to be very good, right away, because he's an elite player. Yes, he'll be missing three of his top four receivers. It doesn't matter. The difference in skill level between Wentz and Nick Foles is night and day, and it's going to show in the offense's overall performance right away on Sunday. The Eagles are at home against a lesser opponent — the Colts — on Sunday in a team they know well. Not because of a frequent match up, but because of a return to Philly from former offensive coordinator Frank Reich. In my eyes this means advantage Eagles. Jim Schwartz should have the tools to handle Andrew Luck (so long as the Eagles secondary can KEEP RECEIVERS IN FRONT OF THEM). The offense is banged up, missing Alshon Jeffery, Mike Wallace and potentially Jay Ajayi and Darren Sproles. But Carson Wentz is back. That fact alone is enough to pick Philly. Which I will do. Do we ever learn? A week after we all picked the Birds to win a game they lost, we once again are all predicting an Eagles victory. I almost want to pick the Colts just to guarantee we wouldn't go 0-5 for the second straight week. But Doug Pederson's squad has a few thing working in its favor that it didn't have last week. For starters, they aren't playing one of the hottest teams (and QBs) in the NFL. Second, they're at home, where they haven't lost a meaningful* game since December of Pederson's first year. And finally, Carson Wentz is back. The biggest question is whether or not Wentz will have to shake off some rust or if he'll pick up right where he left off last season. Given what we've seen from him in practice, I have a feeling it's going to be the latter. *They lost to the Cowboys in Week 17 of last season when they rested all their starters. The Eagles aren't losing Carson Wentz's return game. I have a tough time seeing the Eagles losing two-straight games to inferior teams. The Eagles have been tough to beat at home under Doug Pederson, and the Linc is going to go crazy with Carson Wentz returning. I see the Eagles riding a tidal wave of emotion to an easy win, while showing the rest of the NFL that there aren’t many cracks in the defending Super Bowl champions.